ATLANTA GA, May 23rd, 2016 — IronCAD, LLC, the leading provider of design productivity solutions, along with AMPS Technologies, the leading provider of next generation FEA solutions, announced major software donations to top universities in Taiwan. 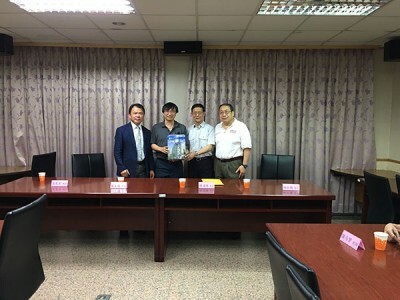 The National Taiwan University (NTU) and the National Taiwan University of Science and Technology (NTUST) received IRONCAD 3D design software and AMPS Multi-Physics Finite Element Analysis (FEA) application. The software will be used within the respective universities’ engineering curriculum for both teaching and research. The president of IronCAD, Dr. Tao Yan Han and the president of AMPS, Dr. Ted Lin, both graduates of NTU, were present at the donation ceremony held at NTUST along with Professor Liang-Jheng Leu, the Chairman of the Department of Civil Engineering at NTU, and Professor Cheng-Cheng Chen, the Chairman of the Department of Construction Engineering at NTUST, along with other faculty members. Based in Atlanta, GA, IronCAD is a leading provider of 3D Design Productivity Solutions that deliver the highest levels of customer satisfaction and productivity. Individual components of this solution can be used standalone, complementary within an existing design environment, or can be used together to collaborate effectively throughout the enterprise to extend productivity. Its flagship product IRONCAD has won many industry awards for its innovative technology and leads the industry in its ease of use and design productivity. IronCAD products are being used successfully by thousands of customers worldwide. For more information on IronCAD, call 1-800-339-7304 or visit www.ironcad.com. (Advanced Multi-Physics Simulation) Technologies Company was established in 2003 with to provide new generation FEA to deliver advanced office-tool style finite element software based on best software engineering design and the most up-to-date FE technology. AMPS Technologies has pioneered SefeaTM (Strain-Enriched FEA) formulation and LSFEA (least-Squares FEA) technology in commercial applications with leading academic and national laboratory researchers and has expanded the technology to stress, thermal, fluid and electromagnetic applications using a consistent framework. As such, AMPS is the only product on the market with the accuracy, reliability, and true multi-physics abilities in CAD-centric analysis when automatically generated low order tetra elements are the favored options. For more information about AMPS, visit www.ampstech.com.